The CFDA Fashion Incubator brand just launched its first women's collection this fall. 2016 is turning out to be quite the breakthrough year for brother Tim and Dan Joo and their five-year-old accessory brand, Haerfest (pronounced "harvest"). In May, they were announced as part of the newest CFDA Fashion Incubator class; in August, they launched their first women&apos;s collection; and just last Thursday, they won the fifth annual Design Entrepreneurs NYC, an MBA-like intensive program in which 12 designers compete for $100,000 based on proposed business plans. "We didn’t come into this with a business pedigree," says Tim, who studied fashion design at FIT and Parsons while Dan worked in computer engineering. But they knew they eventually wanted to work together, and saw an opening in the market for Tim&apos;s elevated backpack design with the brand&apos;s ring and stud system, now a signature for Haerfest. "For us, quitting [our jobs] cold turkey and pursuing this full-time gave us the passion and motivation... we didn&apos;t have an option to fail, almost," said Dan, who sold his car before the brothers headed abroad to produce their first collection. The Haerfest approach to function and design quickly resonated with young, modern professionals and now the brand counts Barneys, Opening Ceremony, Ssense and many more retailers as stockists. "In a day and age where everybody already has everything they need, we’ve put ourselves in a position where we just want [our customers] to carry it with pride," says Tim. In order to grow their business, the brothers want to more holistically understand their place in the market, and their target shopper. "The thing for us is trying to figure out how our customers consume information and really learning how to reach out to them at every one of those touch points," says Dan. Read on for our conversation with Tim and Dan about how they got their start, expanding into women&apos;s accessories and more. You both wanted to start a business together before you necessarily decided on accessories. How did that connection come about? Tim: From the get-go, we had imagined a company that we would ideally like to work with because we always thought, more that anything, it&apos;s about who you’re doing the work with. And we thought if we could surround ourselves with talented people that were on the same page, we can do anything, basically. So yeah, we didn’t really have a product in mind at the start. Dan: Tim was in fashion for a long time and he was always making these great things, [but] it wasn’t until we came across one of his so-called creations that I thought, Wow, this is something different. We started about five years ago and we started by creating an all-leather backpack, and it was interesting because at the time we didn’t see a lot of that. It was a time when people either envisioned the backpack as a school item or a mountain-climbing item, so I thought there was room for this kind of tailored backpack. Since then, it kind of just expanded into accessories for the modern professional. We got a lot of early success with people who are engineers and people who are working as creatives in the city, and we then started to move towards duffel bags, briefcases and all sorts of bags, really. Tim: Yeah, it was more utility and design paired together, and it was actually unisex. But working with department stores, we ended up leaning more towards men’s fashion side of the business. How do you split the work? Who does what? Tim: My background comes from fashion design. I went to FIT and Parsons and I was always passionate about creating things. So when we started, I was more responsible for setting the tone of the brand and also the design of the product. Dan was handling a lot of the business operations, the sales, the financing. But as our team grew, we started working with graphic designers, women accessory designers; we work with a showroom. We are just growing the team and getting more specific with our roles. How has the accessories market changed since you launched? What were the initial challenges? Dan: It’s changed so much, it&apos;s quite an interesting time right now. I think we have brands that are creating their own stores, especially e-commerce but also brick and mortar. We knew when we started that we needed to build credibility, especially not having come from a large house or being in this industry per se, as head designers or anything, so we really focused on working with some of the best stores out there. Tim: And then Opening Ceremony at the time actually bought into our first collection, and that gave us definitely a lot of encouragement to really reach out to other stores. We did start by going to participate in trade shows, but from there, as we continued growing our stockists and getting into the stores we wanted to get into, we started then working with the showroom to handle our sales. How would you describe your brand DNA? Tim: At least from a design point of few, we use the words aesthetic, essence and utility. They are always the principals that we use to approach any design; where aesthetic questions whether it&apos;s pleasing to the eye, essence, it&apos;s mostly about [being] pure in form, and utility being functional. I think when you apply those principles to any type of design, you are able to create something that’s modern and timeless. Tim: We have our male customer and we consider him the modern professional, the multitasker; he’s always connected, he&apos;s always on his phone, using Instagram and Facebook and even Tinder or Bumble. He’s his own brand and curates his own content and really engages with his or her followers. He&apos;s in the know, following Monocle or Nick Wooster; he subscribes to Mr. Porter&apos;s newsletter. I think this person is an urban nomad. [Our female customer is] just a little more professional, embodies empowerment. She’s really her own boss and a go-getter. Whereas the bags for men are a little more tailored but casual, the women’s bags are a bit more structured and make more of a statement. How did you decide to add a women&apos;s line? Tim: We saw there was a lot more opportunity in the women’s market, of course, being as that&apos;s much bigger. And we thought there was room to grow but there were also challenges: how do we translate the aesthetic we’ve already built with products that we’ve created and translate that into women-specific bags? I thought that was a challenge that we were ready to take on. The looks are slightly different but we still feel confident that it&apos;s part of our brand DNA. 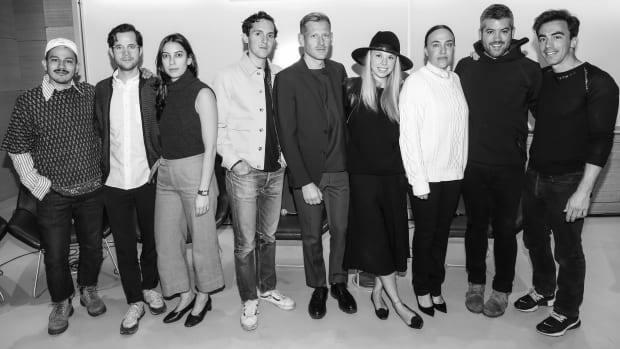 What have you gained so far from being a part of the CFDA Fashion Incubator? Tim: The incubator, in so many ways, has helped grow our business and not just to sell [the program]. I think that the first thing, it links us to their network, and the CFDA is connected to everyone connected to fashion; they have paired us up with industry professionals and executives that are very specific in what [advice they give] us. Dan: As a community with multiple designers, we can come together as community and be like, &apos;Oh yeah, did you do this, did that work for you? Oh yeah, I noticed the same thing here.&apos; Together, we are able to bounce off ideas and kind of figure it out. It definitely brought our relationship closer, Tim&apos;s and mine. We are business partners but we are also brothers and I’ve gotten questions on whether that&apos;s a good thing or a bad thing. [Laughs] And on the good side of things, we really understand each other, but he also knows how to really push my buttons. Sometimes doing two different things can really be a hindrance, but when Tim and I are on the same page, we get a lot done. And that&apos;s one thing I definitely have to thank the incubator for. See the full lookbook for Haerfest&apos;s fall 2016 women&apos;s collection in the gallery below. The New York-based designer and CFDA Incubator graduate pursued her dreams while juggling other brands and consultant work until just last year. 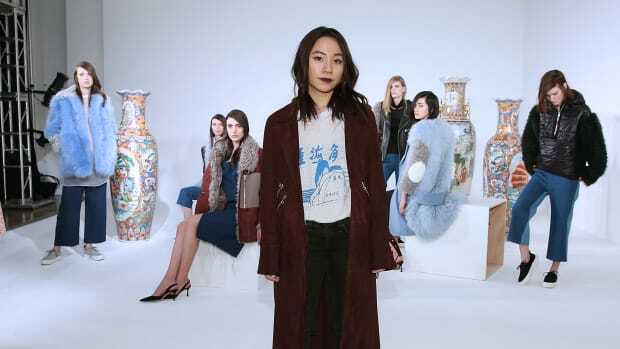 At only 23 years old, the designer is making a name for herself with a Lower East Side cool girl meets Chinatown grandmother aesthetic. She also thinks she might be crazy.